Μετά τον τρύγο της άνοιξης, που είναι και ο μοναδικός του έτους, το μέλι μας παραμένει για κάποιο χρονικό διάστημα ρευστό. Όσο περνάει ο χρόνος και πέφτει η θερμοκρασία, αρχίζει να γίνεται παχύρρευστο, ακόμα και εντελώς παχύ. Αυτό είναι φυσιολογικό και δεν μειώνει την μεγάλη αξία του Θιακού μας μελιού, που το μαζεύουν τα μελίσσια μας με τόσο κόπο από τα πολλά αγριολούλουδα της Ιθάκης. Από τα πρώτα μας μελισσοκομικά βήματα το 1985, εφαρμόζουμε τις αρχές της Βιολογικής Μελισσοκομίας. Το κερί που χρησιμοποιούμε για τις κερήθρες είναι από τα ίδια μας τα μελίσσια, ώστε να μην υπάρχει ξένο υλικό στις κυψέλες μας. Αφήνουμε πάντα τις μέλισσες να τρέφονται από το μέλι που παράγουν οι ίδιες. Παίρνουμε δηλαδή τόσο μέλι όσο είναι το όριο της "προσφοράς" τους. Δεν ξεπερνούμε ποτέ το όριο αυτό, κάτι που θα μπορούσε να θέσει σε κίνδυνο την επιβίωση τους . Με τον τρόπο αυτό οι μέλισσες έχουν επάρκεια τροφών και αποφεύγεται το "τάϊσμα" με ζαχαρόνερο. Με αγάπη φροντίζουμε τα μελίσσια μας, τα οποία βρίσκονται σε σημείο της Ιθάκης, όπου γύρο τους έχουν μόνο άγριο φυσικό περιβάλλον. Το αποτέλεσμα τις προσπάθειάς μας, με τον απόλυτο σεβασμός στους κανόνες της βιολογικής μελισσοκομίας αλλά και η εστίασή μας στις λεπτομέρειες είναι να έχουμε ένα τέτοιο άριστο ποιοτικά και γευστικά μέλι που μας προσφέρει η φύση της Ιθάκης. After the spring harvest, which is the only harvest of the year, our honey remains somewhat fluid. As the time passes and the temperature drops, it begins to thicken and could even become solid. This is a natural process and in no way detracts from the great value of our Ithacan honey, which our bees collect so meticulously from the wide variety of wild flowers in Ithaca. 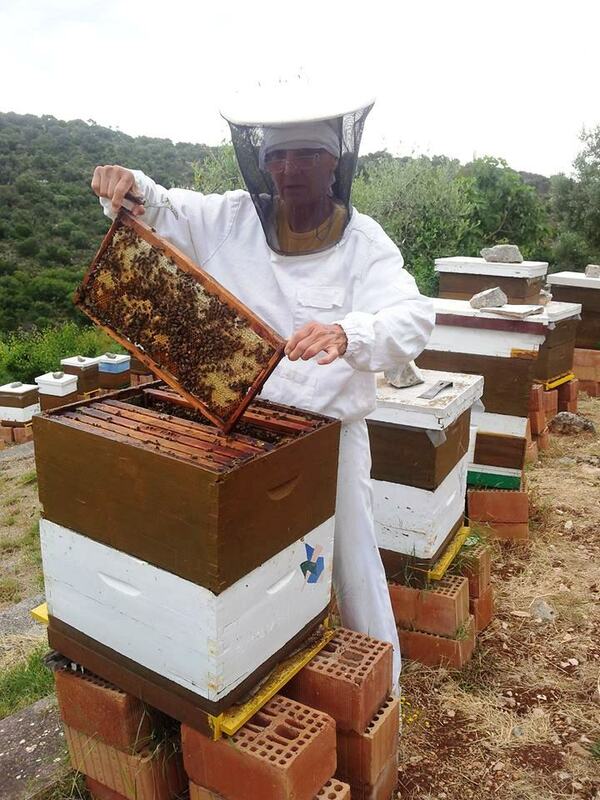 Ever since we started bee-keeping in 1985 we have applied the principals of Organic Apiculture. 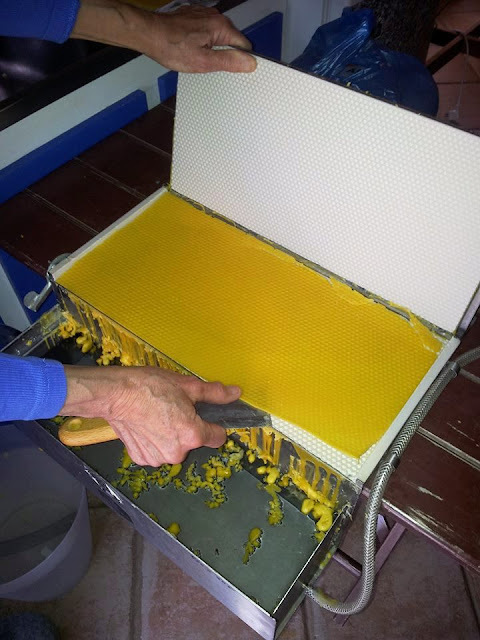 The wax that is used for the honey combs is made by our own bees, such that there is no foreign substance in our hives. We always allow the bees to feed from the honey they produce. We only take the quantity of honey „offered“ by them. We never go beyond this limit, something which would put their survival at risk. 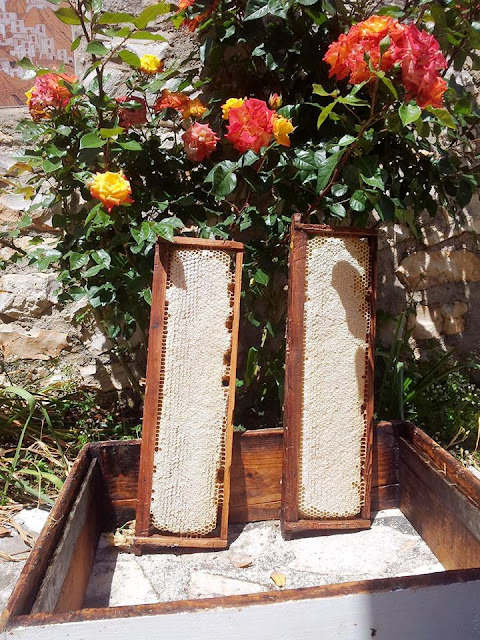 With this system the bees have adequate nourishment and we can avoid „feeding“ them. We are committed to taking good care of our bees, which are located on the island of Ithaca, where their environment is unspoilt and natural. 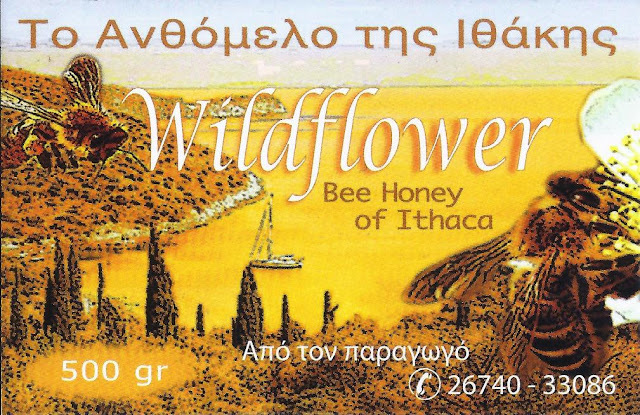 The result of our efforts coupled with complete respect for the rules of organic apiculture and our attention to detail is a tasty honey of excellent quality produced from our natural surroundings in Ithaca. And a suggestion for the protection of the environment: Do not throw away your precious glass jar, we can fill it for you again. Nach der Ernte im Frühjahr, die gleichzeitig die einzige des Jahres ist, bleibt unser Honig noch für eine Weile flüssig. Im Laufe des Jahres, wenn die Temperaturen sinken, beginnt er fest zu werden. Dies ist ein natürlicher Prozess, der in keiner Weise den hohen Wert unseres Honigs mindert, den die Bienchen so fleißig in der weiten Wildblumenvielfalt Ithakas sammeln. Als wir uns im Jahr 1985 entschlossen haben, eine Imkerei zu betreiben, haben wir uns dazu entschieden, nach den Richtlinien der biologisch-dynamischen Bienenzucht zu arbeiten. 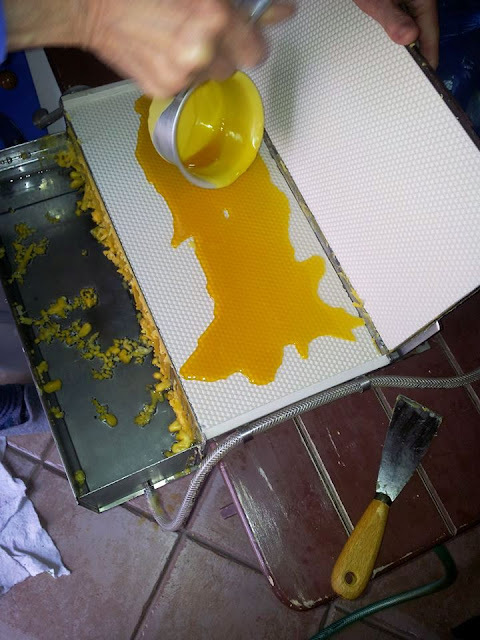 Das bedeutet z.B., dass wir aus dem von unseren Bienen produzierten Wachs, die Mittelwände für ihre Waben in Eigenarbeit herstellen, sodass kein fremder Wachs, der eventuell mit Substanzen belastet ist, in unsere Bienenstöcke gelangt. Außerdem lassen wir den Bienen immer soviel von ihrem eigenen Honig, wie sie zum Überleben brauchen, entnehmen also nur soviel, wie sie davon entbehren können. Auf diese Art und Weise lassen wir den Bienen ihr natürliches Futter und vermeiden dadurch nach der Honigernte eine Fütterung mit fremdem Ersatzfutter. Mit viel Liebe betreuen wir unsere Bienen hier auf der Insel Ithaka, wo die Natur noch wild und unbelastet ist. Das Ergebnis unserer Bemühungen, immer im Einklang mit der Einhaltung der Regeln der biologischen Imkerei und dem Augenmerk darauf gerichtet, dass es unseren Bienen gut geht, ist dieser geschmackvolle und qualitativ hochwertige Honig, den uns Ithakas Natur schenkt. Genießen Sie ihn. Und ein Vorschlag unserer Umwelt zuliebe : Wirf die wertvollen leeren Honiggläser nicht weg, wir können sie dir wieder füllen. Dopo la raccolta in primavera, che e‘ contemporaneamente l’unica dell’ anno, il nostro miele rimane ancora liquido per un po’ di tempo. Durante l’anno, quando la temperatura si abbassa, comincia a indurirsi. Questo e’ un processo naturale, che non sminuisce per nulla l’elevato valore del nostro miele, che le laboriosissime api raccolgono nell’ ampia varieta’ dei fiori selvatici di Itaca. Quando nel 1985 decidemmo di praticare l’apicultura, ci decidemmo subito di praticarla secondo i criteri della cultura biologico-dinamica. Cio’ significa, ad esempio, che dalla cera che le nostre api producono noi ricaviamo le pareti interne per i favi. In tal modo si evita che cera estranea, eventualmente inquinata, possa entrare nei nostri alveari. Inoltre lasciamo alle api tanto del loro miele, quanto loro hanno bisogno per sopravvivere, prendiamo cioe’ solo quanto loro ne possono fare a meno. In tal modo lasciamo alle api il loro alimento naturale evitando un’ alimentazione con alimenti sostitutivi dopo la raccolta del miele. Noi curiamo le nostre api con tanto amore, qui sull’ isola di Itaca, dove la natura e’ ancora selvaggia e incontaminata. Il risultato delle nostre cure, sempre in sintonia col rispetto delle regole dell’ apicultura biologica e sempre noi attenti acche’ le nostre api stiano bene, e’ questo miele che ci regala la natura di Itaca cosi denso di sapore e di cosi alta qualita’. Gustatelo ! E’ una prosota per amore dell’ ambiente: non gettate via le preziose bocce vuote, ve le possiamo riempire un’ altra volta!